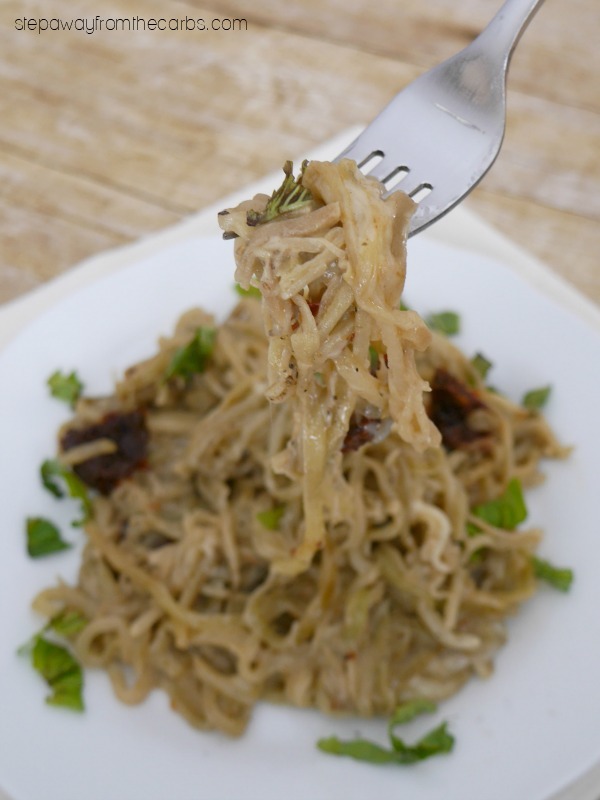 These eggplant noodles are a fantastic low carb and keto alternative to pasta! I thought I’d seen it all when it came to veggie noodles: zoodles (of course! ), carrot noodles, cucumber noodles (coodles! ), butternut squash noodles, spaghetti squash – and more! 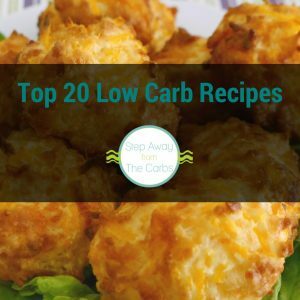 They’re not all low in carbs but the craze has given many people healthier alternatives to regular pasta. Having said all that… have you tried eggplant noodles? 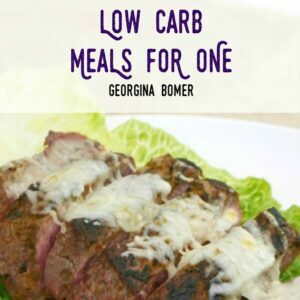 There are about 13g net carbs in a large peeled eggplant (16g if unpeeled), so if you split one between two people, and keep the carb count of the other ingredients down, it can become a great low carb option! To make the noodles I used a thin julienne attachment for my mandoline. 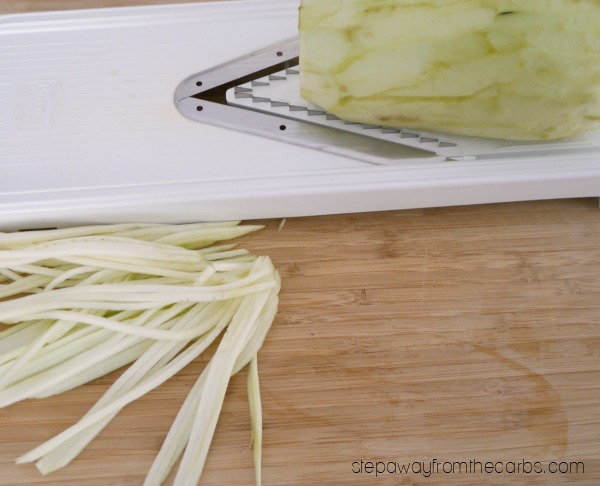 I’ve used the mandoline for making veggie chips, but I’d never thought to use the julienne blades. I guess when I’m making zoodles I don’t want to include the seeds, so it seems easier to use a spiralizer or similar gadget. After peeling the eggplant, it reduced it to spaghetti-like strands in a matter of minutes! Note: Some chefs advise salting raw eggplants before cooking to bring out the moisture. I’ve never found this necessary, and didn’t do it for this recipe! 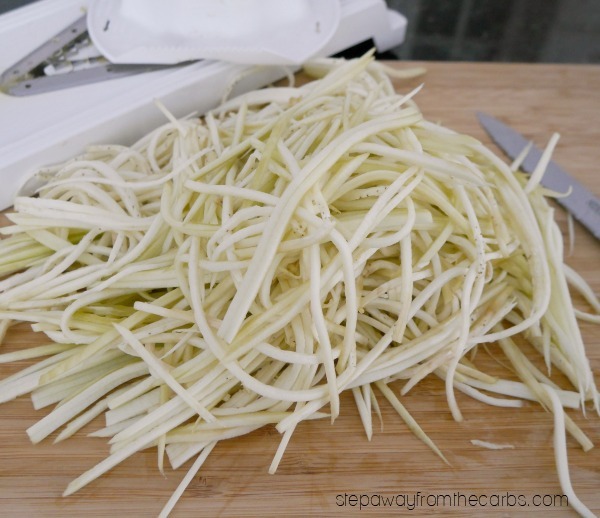 But if you prefer this technique, it might be better NOT to use a julienne blade – but to cut them into this slices, salt, leave for 30 minutes, wipe dry, then cut into noodles by hand. 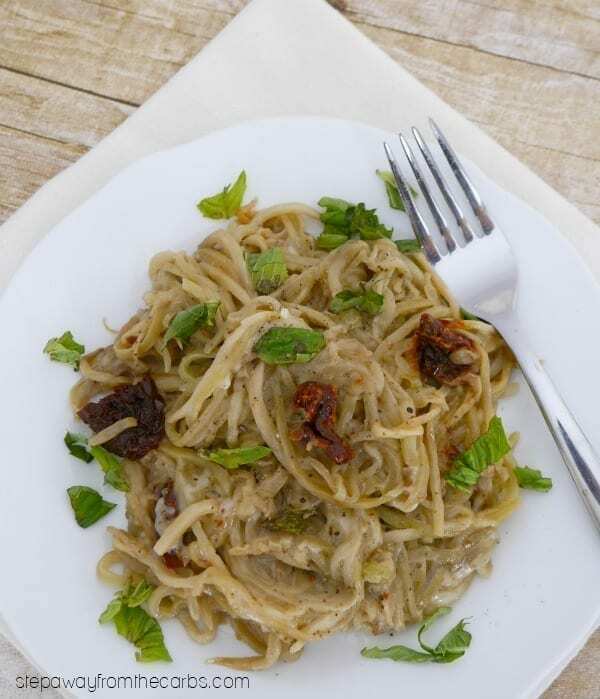 To cook the eggplant noodles, heat some olive oil in a large skillet and add the noodles. Cook for five minutes, stirring frequently. Add some chopped sun-dried tomatoes and a splash of heavy cream. Season with black pepper and add some shredded Parmesan. Cook until the cheese has melted, then serve, garnished with fresh basil. 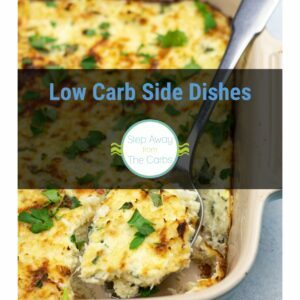 This dish is a great size to serve for lunch – but of you want to make it into a larger meal then you could just add some cooked meat like chicken, bacon, or beef! 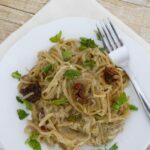 I was really impressed with the texture of the eggplant noodles – they are way more like regular spaghetti than zoodles or shirataki. I’m converted!! 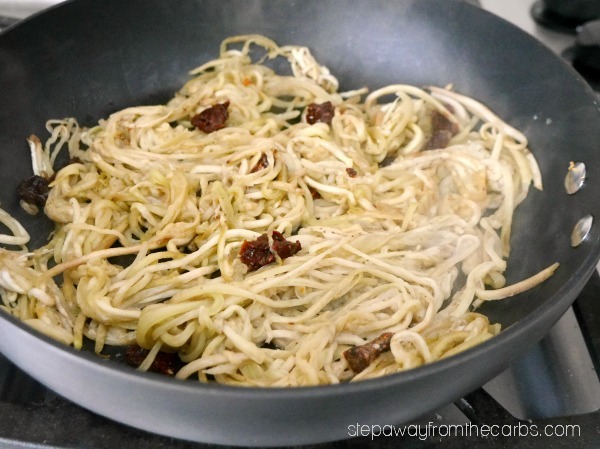 Heat the olive oil in a large skillet and add the noodles. Cook for five minutes, stirring frequently. Add the chopped sun-dried tomatoes and a splash of heavy cream. Season with black pepper and add the Parmesan. Cook until the cheese has melted, then serve, garnished with fresh basil.